The user interface will also be significantly simpler. For instance, instead of selecting services and programs from a long list of Energy Trust offerings, users will be able to type in what they are looking for and choose from available options. In addition, the “search by company name” feature will be more prominent on the search home page. The search results page will offer a number of new features. Once customers complete their searches, they can narrow their results by filtering for different services, certifications and cities. Contractor contact information and company details will be easily accessible from within the list of results, and the feature that allows customers to build their own lists of contractors to contact will be better incorporated into the results display. Guidance and star ratings will also be clearly visible on the results page. Watch for additional updates when the new tool is launched in June. 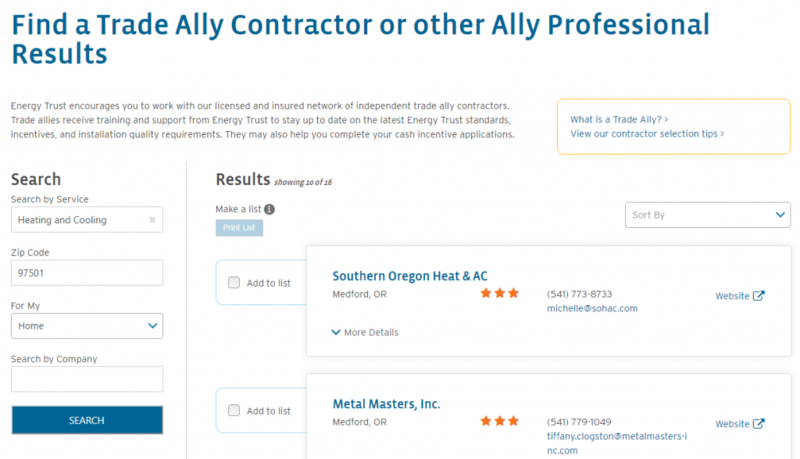 If you have questions about your listing on the Energy Trust website, please contact Ashley Prentice, trade ally project manager, at 503.459.4070.